RECs are complicated and contentious… but what exactly are they, anyway? Lately there’s been some discussion about RECs and their status as it relates to solar in Vermont. First, a quick refresher: What, exactly, is a REC? And what does it mean when a REC is ‘retired’? Renewable energy certificate “REC” tracking systems are electronic tracking systems that ensure that RECs are only “retired” once. “Retirement” of a REC means that the REC has been used by the owner; it can no longer be sold. (Renewable Energy Vermont REC Factsheet, 2016). Solaflect’s more than 100 customers in Norwich are all legally solar, and the RECs have been retired. The RECs have also been retired on all solar power provided by Solaflect Energy community solar parks to the Marion Cross School, all buildings of the Town of Norwich, and the Norwich Public Library, and they all legally receive solar power. The rules governing RECs changed substantially in 2017; the default now is that RECs are transferred to the utility, and that they must be retired in Vermont.Nonetheless, Solaflect Energy has vigorously opposed the Public Utilities Commission’s (PUC) rules on RECs. We have provided both written and oral testimony on several occasions. The current rules encourage dishonesty at worst and muddled language and confusion at best, and they severely penalize Vermont businesses wishing to make solar claims when selling products to a national audience. Given the integrity and value of Vermont branding, particularly for environmentally related products (e.g. organic food), we feel this is a huge mistake on the part of the PUC. Vermont currently spends $3.25 billion on energy each year, the vast majority of it outside the state, often supporting highly damaging fossil fuel development — whether fracking in Appalachia, strip mining in Wyoming, or oil development and sometimes suspect politics in Oklahoma, Nigeria, Venezuela, Saudi Arabia or Russia. Every time a solar module is installed in Vermont, fewer dollars need to leaving the state to purchase energy for the next 20-30 years. There are zero jobs in Vermont from fossil fuel production. Solar in Vermont, on the other hand, supports dozens of businesses and more than 1,500 local jobs. 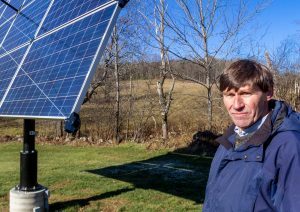 However, the number of those jobs has declined significantly in the past year, due to Vermont policy changes (seehttps://vtdigger.org/2018/02/13/vermont-solar-job-losses-tied-net-metering-changes/).